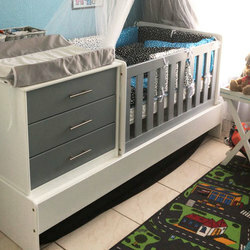 Convertible Baby Room Set, that will grow with your baby, everything you will need in one set. Please Note No chipboard, Melamine or Formica is used in the manufacturing of our furniture, only 100% A Grade Supawood, sprayed finished in top quality (lead free and child safe) lacquer. give a smooth, hard wearing finish and manufactured to British safety standards. To place an order please follow this link to order your Convertible Baby Room Set.